Step 2: Select Import… from the File menu. 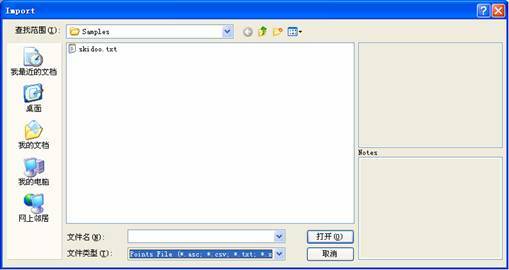 The import file dialog box is displayed. Browse for the file skidoo.txt (typically located in C:\Program Files\Rhinoceros 4.0\Plug-ins\RhinoResurf\ Samples\) and click Open from the Open dialog box . 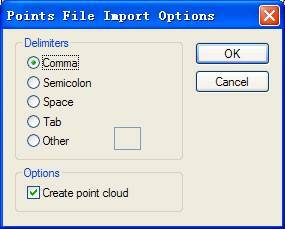 After a while, the Points File Import Options dialog box is displayed, select the delimiters as Comma and click OK . Step 3: Zoom to the extents of the drawing ( View->Zoom->Extents ). You will find the mesh from skidoo.txt imported into the current model. Click Single surface from points from the Resurf menu or type RsPoints2Surf at the Rhino command prompt or click icon at RhinoResurf toolbar. Step 4: The Rhino command prompt ‘Select a point set to create a nurbs surface' is displayed. Click left-mouse button to select the displayed point set, then click right-mouse button after you selected the point set. 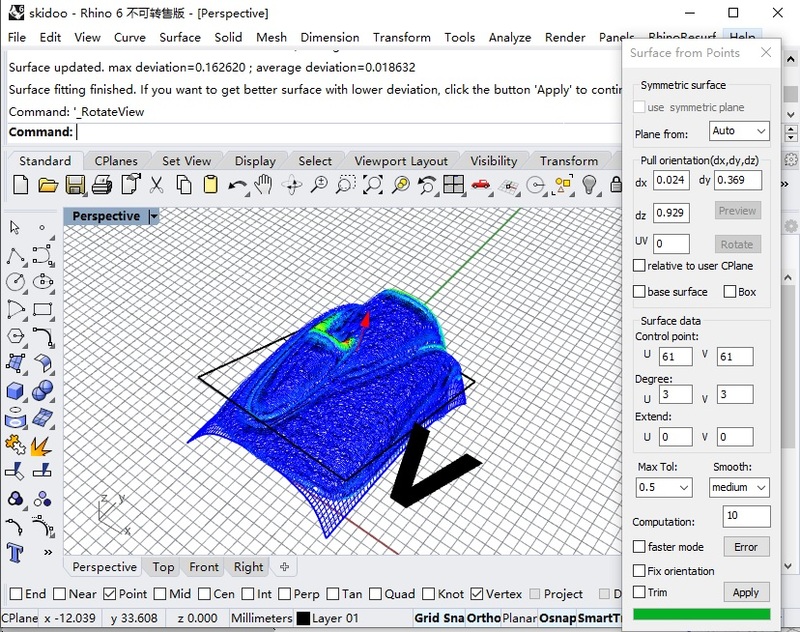 The dialog box Single surface from points is displayed. An Initial surface, a fitting plane and three directions were generated. The surface result is OK, but it does not reach the desired precision. Step 5: Click the Apply button in the Single surface from points dialog box. The program will run. After a while, a surface will appear. The prompt Surface updated. max deviation=0.162620. average deviation=0.018632 tell you the tolerance between the surface and the selected point set. Step 6: If the deviation between the surface and the selected point set is not desired, select the Max Tol choice box and choose a smaller value (such as 0.1), then click the Apply button, the surface will be updated under the constraint of the smaller deviation. Here, select the Max Tol = 0.1, click Apply again, you will see the prompt Surface updated. Max deviation=0.084428; average deviation=0.007079 . Continue to select Max Tol = 0.05, click Apply again, you will see the prompt Surface updated. Max deviation=0.048147; average deviation=0.002755 .